The flamboyant billionaire plans to perform a wedding ceremony Wednesday at 35,000 feet, onboard the inaugural Virgin America flight from San Francisco International to Las Vegas, NV. Branson will join his marketing director and his marketing director's fiance in holy -- and marketing-friendly -- matrimony, according to Virgin corporate communications director Abby Lunardini. If you are wondering how a "Sir" can legally marry people over here in the states, it's because he reportedly is ordained as a minister in the Universal Life Church, an accreditation that can be applied for online. "We thought Virgin America and Las Vegas would be a perfect match," Lunardini said. "Since many people travel to Vegas to get a quickie marriage, we thought it would be a fun thing to do, to have a wedding on the flight." After the wedding, Branson and the rest of the Virgin gang -- including Virgin America CEO Fred Reid -- will host a party at the Wynn resort, according to Lunardini... replete with a celebrity poker game and dancing girls, natch. While an in-flight wedding isn't something you'd expect from, say, United or American Airlines, it does fit the admittedly zany style Virgin America has used to set itself apart from other low-cost carriers. 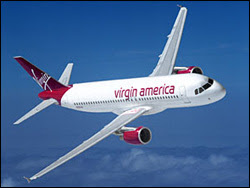 As you may recall, this is the airline that asked its passengers to name its planes; Branson also received some ink for tossing a glass of water at Comedy Central host Stephen Colbert, during an interview to promote Virgin's naming of one of its A320s "Air Colbert." So, one could argue in-flight nuptuals is actually rather tame, for this group anyway... but that isn't all Branson apparently has planned. In a release to ANN, Virgin sent out notice of another planned activity marking the launch of Virgin America's Vegas service... Sir Richard also plans to repel 407 feet off the Palms Casino Resort's Fantasy Tower, in a ceremony hosted by magicians Penn and Teller. You simply HAVE to love Branson's style. He is one colorful dude, but let's be real – If any of us had his coin and owned an airline, we too would be doing just about any damn legal thing we wanted. Paint the planes hot pink with lime green polka dots? Hell yes. Serve 101 kinds of imported beer? Why not. An on board Alderwood Bar-b-que? Just gotta figure out the exhaust system and that side 'o beef will be history, brother. The most exciting thing about watching the Virgin America story unfold is that nobody has any clue what they will do next.